Named GQ style's 2007 'Man for the Season', Sean O'Pry's rapid ascent onto the industry's hot list has been nothing short of spectacular. Charming and outgoing, with a face that belongs on a Renaissance statue, this young American has some major players interested in him - the main one being Calvin Klein. 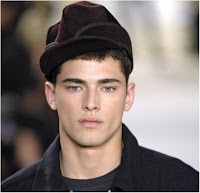 Sean was discovered through his Myspace page and has been on various catwalks and editorials ever since. He was the face of Barney's Coop Spring/Summer 2007 campaign.